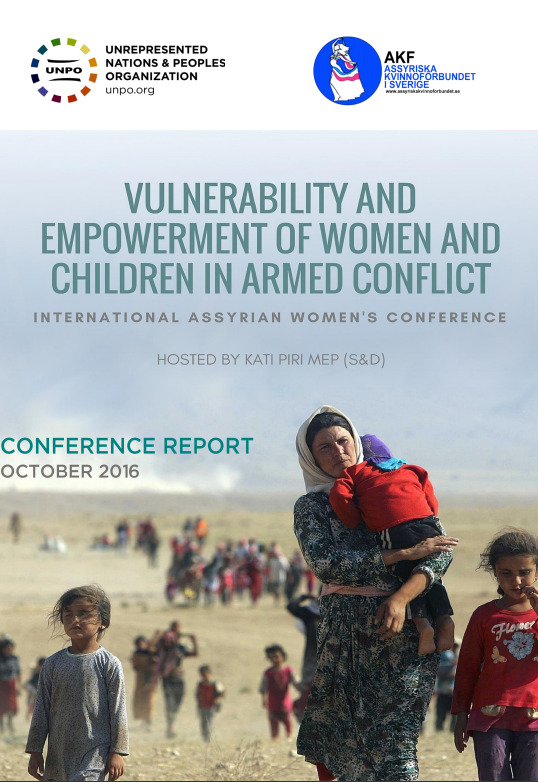 The report contains transcripts of the speeches given at the conference, namely the instructive contributions by Kati Piri MEP (S&D), Nursel Awrohum (Assyrian Women's Federation of Sweden), Johanna Green (Programme Manager at UNPO), Sabah Elia, (Women’s section of the Assyrian community in Södertälje, Sweden), Ms Februniye Akyol Akay (Midyat Syriac Culture Association, Assyrian Research Centre Association) and Attiya Gamri (PvdA Women’s Movement in The Netherlands). A devastating and protracted humanitarian crisis is currently ongoing in Syria and Iraq, with brutal violence and chaos forcing millions to flee their homelands and leave everything behind. Women and children comprise the majority of people displaced by this crisis, consequently suffering additional psychological, emotional and physical trauma. The Assyrians, an ethnic and religious minority, whose traditional homeland comprises parts of northern Iraq, Syria, Turkey and Iran, have seen their already precarious situation deteriorate since the advance of the so-called Islamic State. This places Assyrian women in an even more complex situation, being women belonging to a minority group in a conflict zone. Against this background, this conference, organised by the Unrepresented Nations and Peoples Organization (UNPO) in conjunction with the Assyrian Women’s Federation of Sweden, and hosted by Kati Piri MEP (S&D), discussed the multiple challenges faced by Assyrian women and children in conflict zones and highlighted the urgent need for international action to end their suffering.